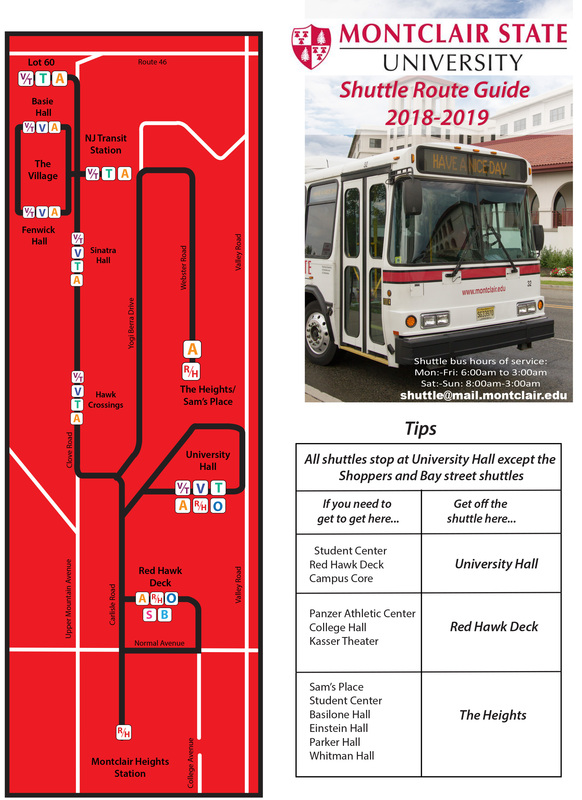 The Montclair State University Shuttle Bus System serves employees, students, and visitors traveling around campus. We are here to help you get around campus quickly and safely. We are committed to providing efficient and responsive customer services by effectively managing all shuttle bus activities on campus. We welcome your comments regarding the campus shuttle bus system. Do not cross the street in front of the bus. Cross the street behind the bus. This helps you to see, and to be seen by other motorists. When driving another vehicle, do not pass a stopped bus unless you are in a passing zone. Be ready to get on or off the bus when it stops. Drivers are instructed not to open the doors again once they begin to re-enter traffic. Drivers are instructed to load and unload at bus stops only. If standing, please move to the center of the bus. Drivers are instructed not to move the bus with people standing in unsafe locations on the bus. Montclair State University bus drivers are trained, professional bus operators and take pride in their ability to prevent accidents each day. University students and employees who have smartphones can sign up for The Rave Guardian and The Circle of 6 mobile applications.